So, not to fuel the constant controversy on tone woods. We ask the constant question again. Does the wood you use in your “electric” guitar really matter? Well, read the blog and then tell us. Keep in mind that the electric guitar has many components that bypass the wood you are using. Wood vibrates as a secondary component of the instrument. You got the strings, pickups, wires, plug, pedals, and the amp. Does the wood come into play? 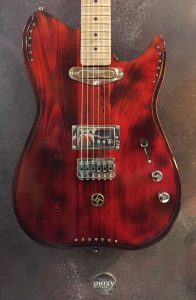 The blog reviews various woods used in guitar manufacturing. We do need to separate “electrics” from “acoustics” when it may come to wood tone. …is the most versatile and durable of all the hardwoods. It is a dark, red-brown colored tropical wood that is resistant to insects and rot, has an attractive grain, and polishes to a beautiful high sheen. Mahogany wood comes from South America and Africa. The wood from Africa has a tight grain and mostly used in interior design. Seen in yachts, boats, musical instruments (drums, pianos, guitars, and violins). There are 49 types of Mahogany with many practically extinct due to its popularity for furniture and musical instruments. Guitars and basses made from Mahogany are unique. It gives a warm timbre with a lot of bottom end. Les Paul type guitars are well known for their mahogany body with a maple top giving an incredible balance. Today’s Mahogany are not like the Mahogany used in guitars from the 40s or 50s. …is used to manufacture baseball bats. They do tend to shatter if they break due its hardness. Maple wood is also used in guitar manufacturing. a very hard type of wood. This wood offers good tonal qualities and sustain. Seen on top of guitar bodies to brighten the sound (i.e. flame or quilted maple tops). You see it in guitar necks due to its strength. …comes from Eastern North American Linden trees. Grain is straight, with a fine-even texture and a moderate natural luster. Basswood is very soft, light, easy to work with, and finishes well. Perhaps one of the most suitable wood species for hand carving. Also used in lumber and musical instruments. This wood can dent easy. Good for instruments that have an opaque paint-job. It has a warm, balanced sound with great mid-range and good sustain. …comes principally from the Pacific Northwest where it is most abundant for commercial hardwood. It is a relative of birch and white when freshly cut. Air changes it to light brown with a yellow or reddish tinge. The wood is fairly straight-grained with a uniform texture. When stained, it blends with walnut and cherry. It’s a soft / lightweight hardwood of medium density. Used in furniture, kitchen cabinets, doors, carving, and guitars. Used to be very popular in the 50s and 60s. Many well-known guitar manufacturers from that era used it in their electric guitars. Today, the wood could be a bit more expensive and it’s not as common. Alder wood has beautiful grain patterns. It also gives a warm sound with plenty of highs. An instrument made from Alder is likely to have less midrange and bass than instruments made from other types of wood. …is a common name for several North American trees in the genus Fraxinus which may grow in swamps and other wetlands. The wood of swamp ashes is relatively low in density and is used in the construction of musical instruments. Swamp Ash has a great sounding tone wood that takes a finish beautifully and is light enough to resonate. It is strong enough to be stable. Some of the best sounding vintage guitars were made from Swamp Ash. The wood is lightweight, nice looking, and has a pleasant timbre. It also has good sustain, firm bass tones, bite in the midrange, and airy highs. …is widespread throughout the eastern US. The sapwood is creamy white. Used in cabinetry, pallets, crates, upholstered furniture frames, paper (pulpwood), plywood, and guitars. Poplar is a utility wood in nearly every sense. It is often considered as the other “traditional” Stratocaster body wood. Poplar is one of the softer hardwoods, nicely resonant with a meaty tone. Many guitar manufacturers use it as a substitute for alder which is quite similar in tone. “The Great Electric Guitar Tone Wood Debate: Solved!,” Elton Edgar, Spindipity, November 12, 2015. “Guitar Wood: A Guide to the Tonewoods used in Guitar Building,” Scott Marquart, Guitar Gear, April 14, 2015.